Many Christians know little about the history of the church. As a result, they’re missing a testament to God’s steadfastness over the centuries. 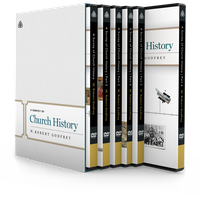 In this monumental study series, Dr. W. Robert Godfrey sheds crucial light on church history, demonstrating God’s promise to build and preserve His church so that “the gates of hell will not prevail against it” (Matt. 16:18). Across seventy-three messages, learn why having a working knowledge of church history remains relevant for our personal lives today, and for the church as a whole. This set includes Part 1 A.D. 100-600, Part 2 A.D. 500-1500, Part 3 A.D. 1500-1620, Part 4 A.D. 1600-1800, Part 5 A.D. 1800-1900 and Part 6 A.D. 1900-2000 on DVD. *No substitutions or variations in DVD sets are allowed.